4. Not so fast with those FastPass+ selections. 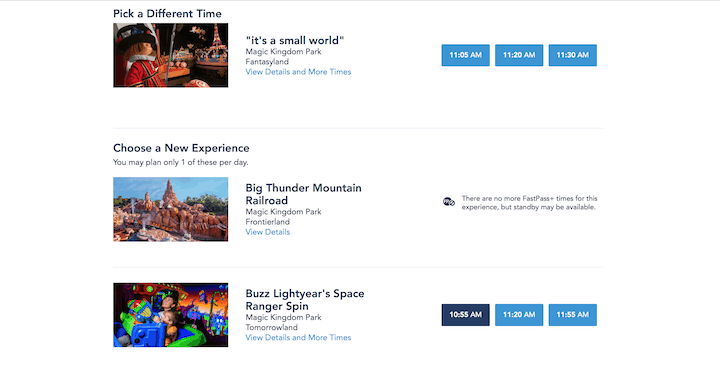 It makes sense that if you have the Park Hopper option on your Walt Disney World tickets, that you should be able to make FastPass+ selections (up to the max of 3 per day in advance) across multiple parks. However, at this time, the FastPass+ system will only allow you to make selections at one park per day. In fact, if you try to make those selections at more than one park via the My Disney Experience app, you’ll get a friendly little message on the app that reads, “Not so fast!” From there, you’ll be redirected to make all three selections in the same park for that day. Hopefully Disney will revise this policy to allow for FastPass+ selections across multiple parks, but for now, it isn’t permitted by the system.